This page is written by the game's inventor, Yu Ren Dong. A relative of Huntsman Chess . Each player would move his non-royal pieces as any-owner Hunt Trophies whichever are standing on adjacent squares. 1. 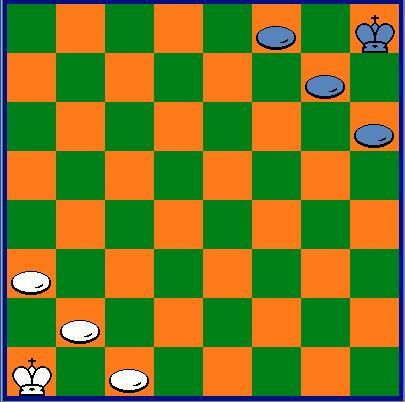 King may step orthogonally or diagonally into one square which is empty or occupied by Opponent's Stone. King leaves behind a friendly Stone, after capturing an Opponent's Stone. 2. Trophies are the pieces which are not movible nor being captured. Ferz: Stones may make a (1, 1) step. Vizir: Stones may make a (1, 0) step. Dabbabah: Stones may make a (2, 0) leap. Elephant: Stones may make a (2, 2) leap. Knight: Stones may make a (2, 1) leap. Camel: Stones may make a (3, 1) leap. Cannon: Stones may slide on row or column, captures by jumping. one of their own seven Hunt Trophies on any empty square. 2. The object of the game is to checkmate Opponent's King. Simple chess variant invented by Yu Ren Dong in Nov 2009. It is his fourth Chess variant.